I’m pretty excited to finally share this. 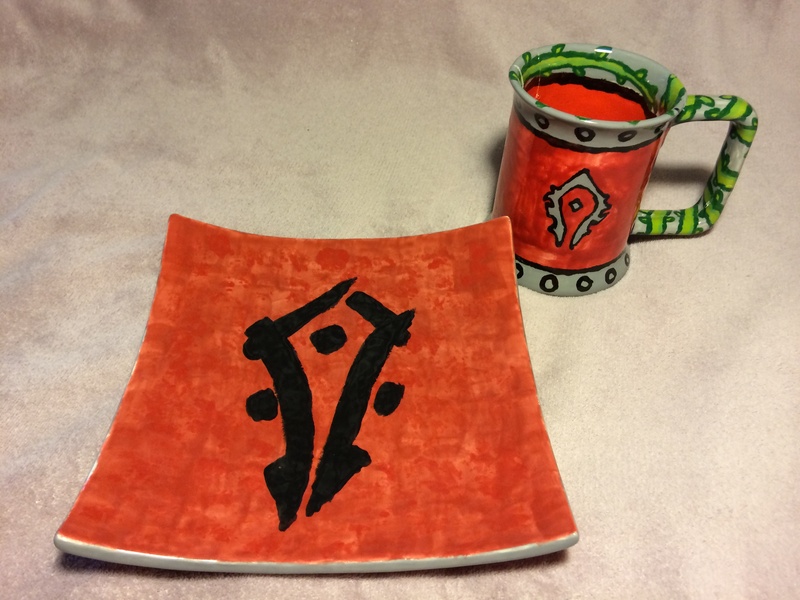 I painted this Horde plate and Horde mug at Color Me Mine! In case you’re not familiar with the chain, allow me to briefly explain. 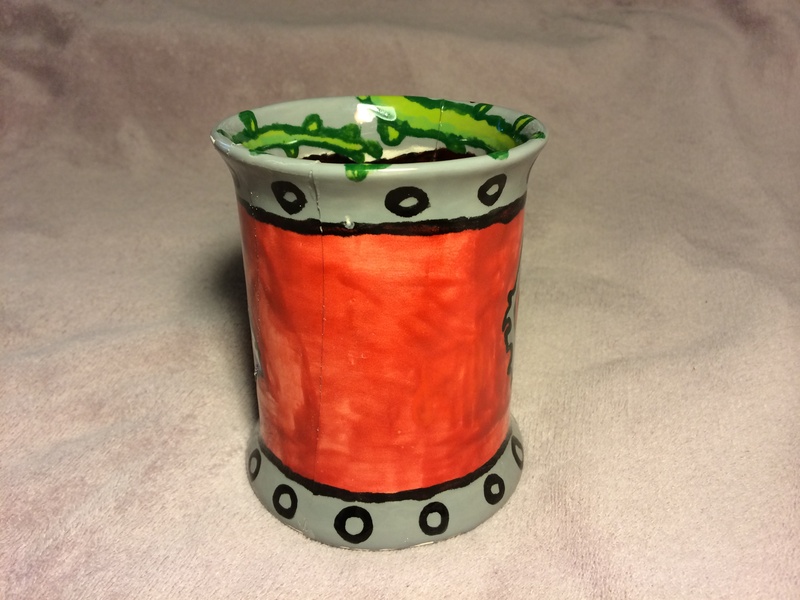 Color Me Mine lets you choose and purchase ceramic pieces. Once you’ve chosen, you paint the piece there in the studio. They fire it while you go about your week, and a week later you can pick up your finished piece. Because I’m more excited about the mug, I’ll talk about the plate first. I painted this on February 22 of this year. We were celebrating Mooglegem’s birthday! If I spend too much time on details, I won’t be able to finish in a single evening and will have to return multiple times. To avoid that with this plate, I tried to keep it simple. 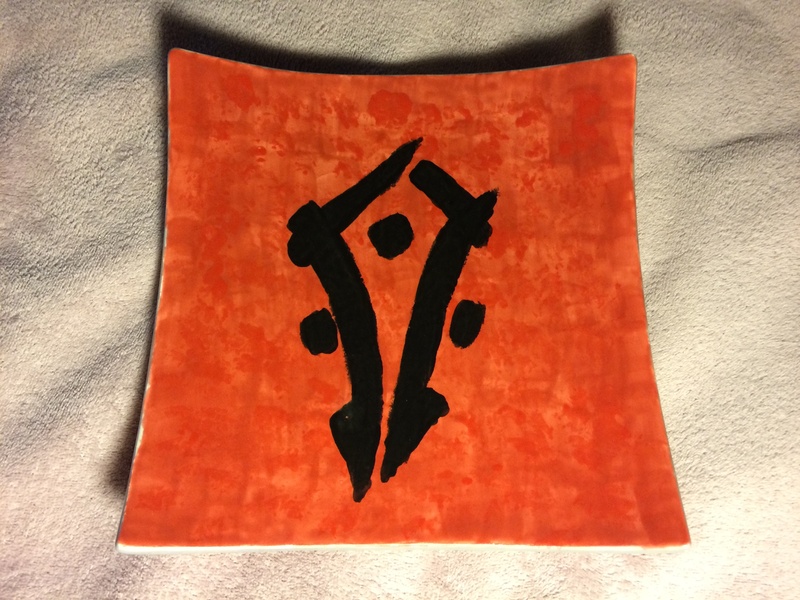 I based the Horde symbol on the way it appears on the banners at the Shrine of Two Moons in Mists of Pandaria. It’s clearly Asian-inspired. The plate’s simple, but I’m pretty happy with it! This mug is a much bigger deal. I’m so happy to finally have it completed. I don’t remember when I started it, but I do know that I signed and dated the bottom, and when I checked today, the year on the bottom was 2012. I put a lot of work into this. In fact, it took me much longer than a single session. I probably went at least five times, spending hours each time. There was some other stress involved as well. Normally, you pay for the piece and you pay a studio fee to paint. If you purchase one piece or three pieces, the studio fee remains the same. If you don’t finish and bring a piece back, you don’t need to purchase the piece again, but you’d need to pay the studio fee again. This side’s pretty boring. My intent with the colors here was to get that metal look with which Garrosh infused the Horde. Those circles were supposed to be metal rivets. I don’t know how well that came across. 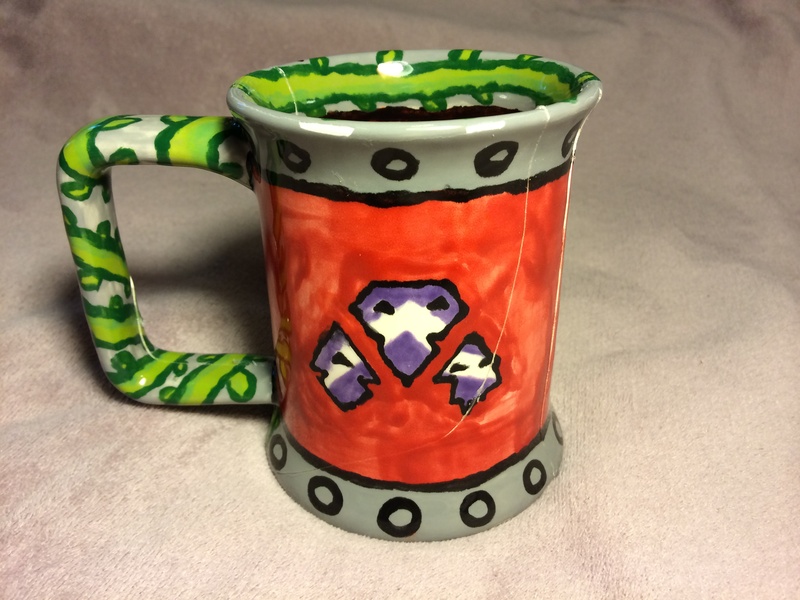 I spent so much time on the mug that the Color Me Mine at which I purchased the piece closed. However, they had assured me when I began that I could take it to any store to continue working on it. The manager at the other store, however, seemed pretty upset by it. He made a big deal about how he can’t profit if I’m not purchasing from him. I guess he didn’t think the studio fee was high enough. Regardless, he was very huffy about the whole thing but let me work there, and I eventually finished. I’m not very artsy usually, so it was a big deal to me. As a troll, I had to include some Darkspear love of course. Too bad a crack runs through the right mask. A week after I finished painting, I went to pick up my piece, and it wasn’t really a piece. It was a bag of pieces. It had exploded in the kiln, which happens sometimes. I asked to look at the pieces because I was curious how it turned out, so the woman working there handed me the bag. A few moments later, she told me something about how she’d throw the pieces away for me, but I told her that I still wanted to keep it. She told me that they can’t let me do that because the sharp pieces are dangerous. This seems rather dumb to me, because I could always break a piece and then cut myself on it, right? Well, I told her that I really still wanted it. I think it helped that I was still holding the bag, and I honestly wasn’t going to give it back to her. I had already paid, I didn’t consider theft, and I doubt she would have physically stopped me. Luckily, she said okay, although she did make me sign the back of the receipt after she wrote something about how they wouldn’t be held responsible if I hurt myself. The handle has a vine wrapping around it. It took a while to do that due to the shading. I kept the bag in my room for a long time. I wasn’t sure what to do with it. There was lots of conflicting advice on what type of glue to use and how to fix it. Rather than choosing something, I kept putting it off. 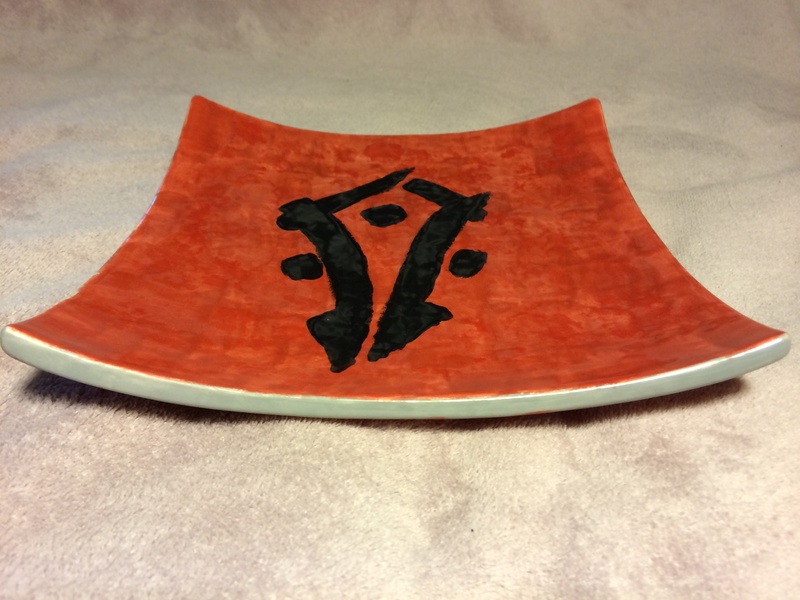 When I painted the Horde plate, Mooglegem and I chatted with the staff, and one woman mentioned being able to glue pieces together there in the store. 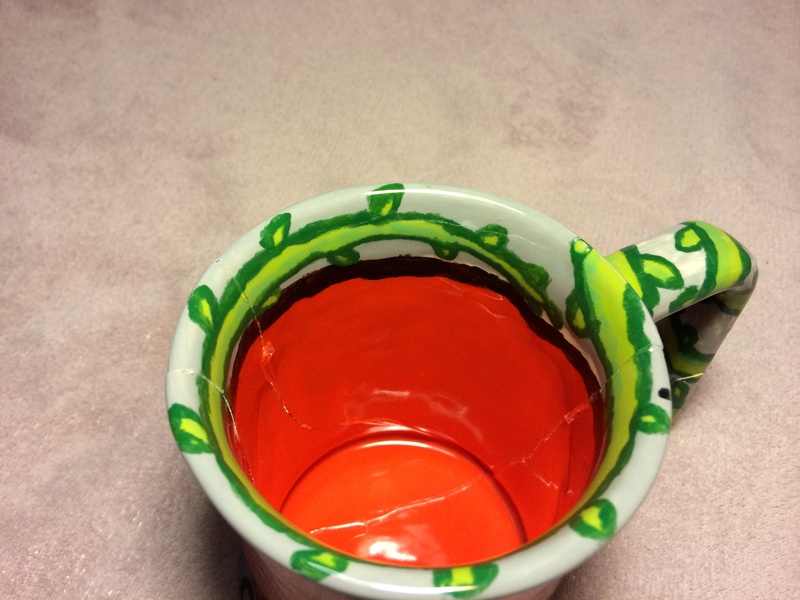 When I picked up my plate, I brought my mug with me, and they glued it back together for me! For those wondering, the Color Me Mine in Tustin, CA on El Camino Real is a great business, and the people who work there are terrific! 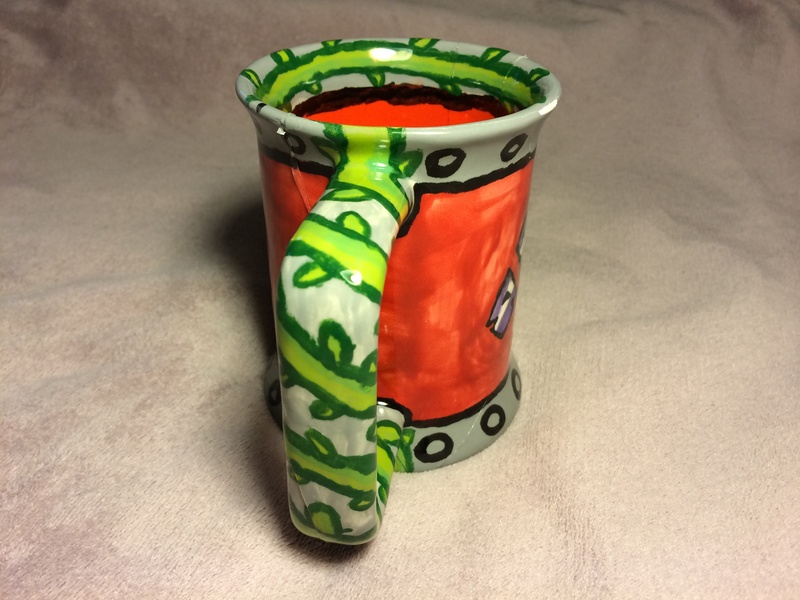 The vine reaches the top and wraps around the inside of the mug. 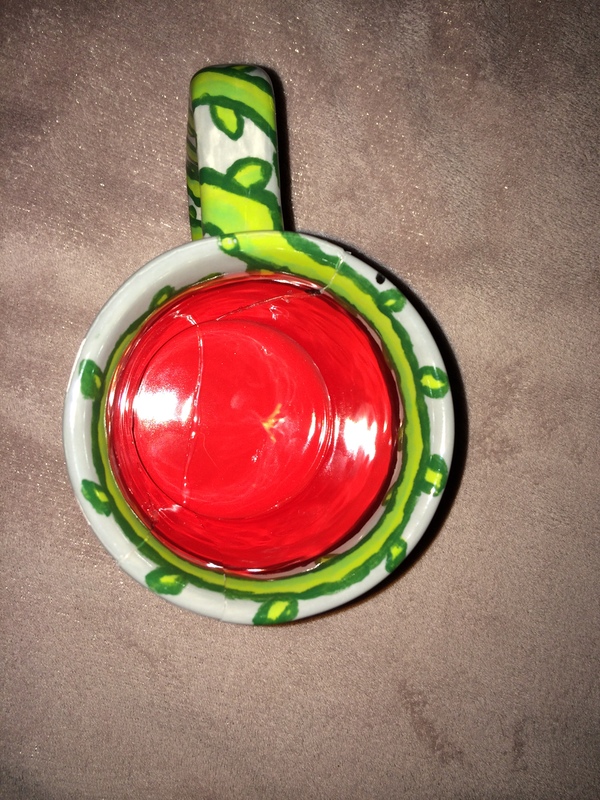 It’s not safe to drink from it, but I created it for artistic reasons, not utility. I’m really pleased to have them completed. Now I just need to figure out where to display them! Oh, and I suppose that the cracks just add to the representation. The Horde are the outcasts and underdogs. Individually we might be broken, but we come together! 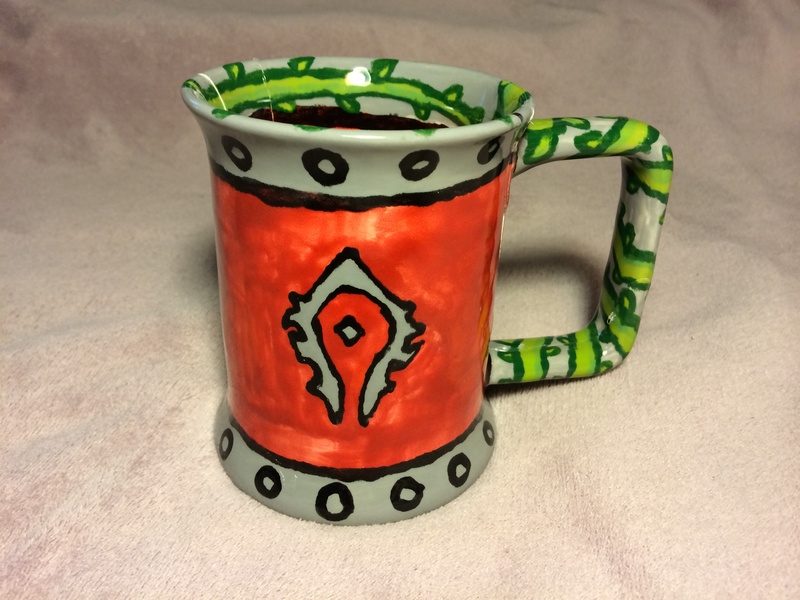 It’s apt that I didn’t get this glued together until after the Siege of Orgrimmar as well. Even though the Horde has been shattered, we piece ourselves back together!